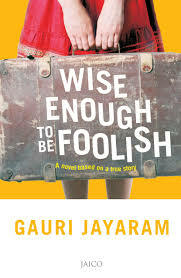 Wise Enough to be foolish is a fictionalised memoir by Gauri Jayaram. The book traces the journey of an Indian girl’s life, with all its challenges and delightful surprises , as she blossoms from an insecure childhood into a confident young woman. Author, Gauri is a mother of two girls, amateur athlete, part-time writer, management school drop-out , traveller, entrepreneur and employed with a touring company. The first thing I liked about the book is the pace. Not a boring moment. 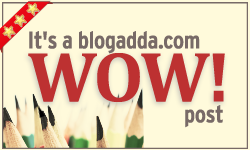 Couple that with audacity to be candid and superb articulation and story-telling. You have a winner. In the story, Gauri is the black sheep of the family, although she went from black to brown and blended from time to time. The feeling of not being loved esp by the parents is one that can’t be explained only felt but being the black sheep comes with its own advantages – you don’t have to look for social approval and do what you like and live your life. And live she did. Probably that is what makes the book a superhit. Her life has been one hell of an adventure. Every girl can relate to something or the other in the book. The honesty of her thoughts and feelings is what makes this truly an “unputdownable” book. If you are foolish enough to get on the roller-coaster ride with her, I am quite sure you will come out wiser at the end. @Gauri: This is one flight you haven’t missed! Check out my review on The Great Gatsby. Follow back?